The top seven supermarkets in the UK sell 59 billion pieces of single-use plastic every year, according to new research by the Environmental Investigation Agency (EIA) and Greenpeace UK, highlighting just how far retailers and supermarkets have to go in improving their plastic usage and waste. To get their data, the EIA and Greenpeace surveyed and ranked the plastic habits of the country’s biggest grocery retailers. The report found that 810,000 tonnes of single-use plastic are placed on the market by the top 10 UK supermarkets every year, and five of those 10 supermarkets have no plastic-specific reduction targets in place. While Tesco produces the most single-use plastic overall, Iceland and Aldi produce the most relative to their market share – totalling 14,000 and 12,000 tonnes per 1% market share respectively. Waitrose and Co-op had the lowest plastic footprints of the supermarkets that reported their data. Every year, 1.2 billion single-use plastic bags, more than 958 million bags for life, and 1.3 billion plastic product bags are issued to shoppers by the 10 major UK supermarkets – enough for nearly half the world’s population to have a bag each. While many supermarkets are phasing out single-use plastic bags, including Asda, Iceland, Lidl, Morrisons, Tesco and Waitrose, figures indicate that many customers use ‘bags for life’ – which are heavier and contain more plastic – as a single-use option. In fact, Asda and Sainsbury’s reported a 16% increase in 5p bags sold between 2016/17 and 2017/18. According to the EIA and Greenpeace, the top items found on beach clean-ups in the UK are plastic bags, straws, bottles, cutlery, cotton buds and food wrappers. A staggering number of these items are being sold at, or given away by, supermarkets each year. If you’d like to know more about the recyclable packaging in your supermarket shop, head to the Which? investigation into supermarket packaging. What are supermarkets doing to combat plastic waste? Despite the shocking statistics, only 50% of the supermarkets surveyed have plastic-specific reduction targets, according to the EIA and Greenpeace report, including Asda, Iceland, Lidl, M&S and Morrisons. All the major supermarkets in the UK have pledged to do more to reduce the amount of non-recyclable plastic packaging they use, by signing up to the voluntary WRAP Plastics Pact. The scheme, which launched in April 2018, is mainly focused on increasing the amount of recyclable plastic, rather than reducing the use of plastic packaging overall. 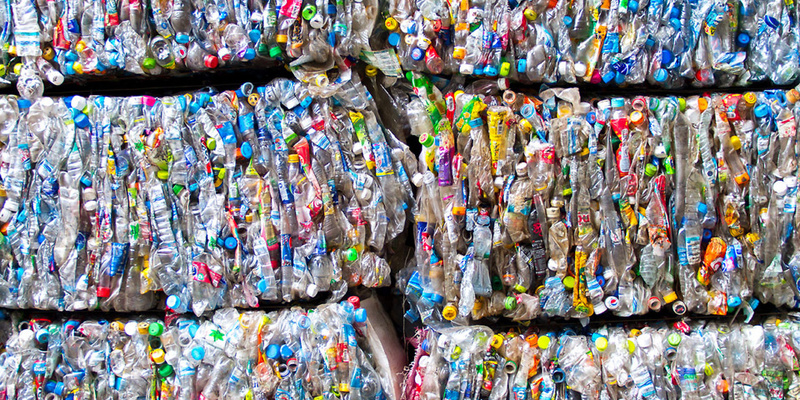 Hold suppliers to account on single-use plastic. Sarah Baulch, a senior ocean campaigner at EIA, said: ‘Decisions taken by supermarkets today result in thousands of plastic items flooding British homes every year. ‘Despite public pressure for action on plastic being at an all-time high, our survey shows that UK supermarket giants are failing to keep up. How much supermarket plastic packaging is recyclable? Almost seven out of ten shoppers (67%) say the recyclability of packaging is important to them when choosing what to buy. The EIA and Greenpeace reported that 79% of Co-op own-brand plastic packaging is widely recyclable, while just 58% of M&S plastic packaging is. But the amount that can be recycled isn’t the whole story, as we discovered in our plastic packaging snapshot investigation. We found that between 71% and 81% of the total packaging from 27 of the most popular supermarket own-brand items from the 10 supermarket chains was recyclable. But we also found huge differences in the labelling of recycling information, including different systems of labelling, items that weren’t labelled with recycling information at all, and incorrectly labelled items. Some items had labels that were only visible once the food was unwrapped – not helpful to those trying to make a considered choice in the supermarket aisle. Even if you have figured out that an item should be recyclable, differences across local authorities mean that a ‘widely recycled’ item may not be recyclable in your area. See our guide on how to recycle in the UK for more information on the plastics found in your supermarket basket, and what the packaging symbols really mean.